I try to document my failures as much as my successes in cooking... as I think reflection on the former is often more illuminating than the latter... but it's a hard thing to do in practice. I think for most of us, when a dish doesn't come out like we expect it's pretty dispiriting... you've spent a lot of time and money on something that's possibly not even edible... and so my first instinct is not to get out the camera and snap a picture of my mistakes. So that's the preamble to why there is not a picture here of my failed attempt at fish and chips this week. I don't often cook fish (not because I don't like fish, but because of the hassles of making sure they are sourced sustainably) nor do I often break out our deep fryer, but I was pretty confident this would be pretty easy. I was making potato chips instead of English style "chips" (aka fries) and a straightforward beer batter as described over at Hunter, Angler, Gardener, Cook for some Atlantic cod. Everything about the recipe went great until the deep frying part. We have a DeLonghi "roto" deep fryer that is generally well regarded, and has worked well for us. I don't like how difficult it is to keep clean (would love detachable parts that are dishwasher safe), but the the much lower amount of oil necessary to operate it is great. Even with how seldom we use it, I also like the fact that I don't need to worry about monitoring the oil temperature. However, with the fish and chips... the oil set to 350-360 degrees F... the chips came out soggy and the batter didn't stick to the fish. 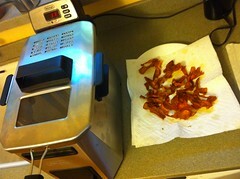 Now there are couple of key points to successful frying 1) right oil at the right temperature and 2) don't overcrowd. I used peanut oil and a deep fryer for #1 and did things in many, many small batches for #2... but no dice. I also held the pieces of fish halfway in the oil to get the bottom coating to firm up before dropping them in, but it still flaked off/stuck to the basket and never crisped up. Unfortunately I didn't think to use my Thermapen to actually make sure the oil temperature was correct... and in reviewing things in my head, that's what I'm suspecting is the real issue here... as I now recall that my last batch of fries was soggy and lame too. At the time I attributed that to the fact that we had frozen them after the initial fry, and suspected there was some problem with how we did it or maybe they were in the freezer too long or something. This probably reveals a little of my engineering bias, where I always first assume the equipment is working fine and it's the user who screwed everything up (whereas said user usually assumes the opposite). It may still be the case that there is something I'm screwing up, but now I definitely suspect it's the deep fryer that's the problem... and it's starting to make me question the idea of even owning one unless you are deep frying a couple of times a month at least. Is it really superior to just using a thermometer and a dutch oven otherwise? I'll have to test to actually know for sure, but I guess that's a good excuse to make some fries... and, hey, it is National French Fry Day. It's also a good reminder for me not to just blindly trust the little red light and use my damn thermometer. UPDATE: Made fries Friday night and checked the temperature with my Thermapen, and the deep fryer was indeed off... low by by roughly 30° F. Was able to make decent fries using that correction factor, but the top end of the thermostat is 375, so I was not able to get up to the 350 you need for super crisp fries. The fryer will be 5 years old in December, so it's not like we didn't get good use out of it... but I do have to question the wisdom of buying another one. I guess I'll have to see how much of a hassle frying in a dutch oven feels like.